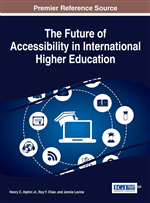 This chapter discusses the complexities associated with the genuine accessible and inclusive internationalised higher education (HE) practises. With the diversification of international student population, it is all the more necessary to ensure that the university policy and practice is compliant and responsive to the differing needs related to students' multiplicity of identities. Practices, which may on surface appear to be inclusive of international students, in reality may not necessarily be accessible to those international students who also belong to one or more other minority groups. This chapter will therefore consider the application of some ‘inclusive' practice insights that accommodate diversity of international students' needs. The conclusion will highlight the benefits of all-encompassing inclusive practices and the resulting wider implications for the student population at large. Governments across the world have linked HE reform strategies to the concept of ‘globalisation’. Internationalisation of education has thereby become an integral part of the diversification programme (Naidoo, 2003). Given this, Gribble and Ziguras (2003) argue that transnationalisation of education is a significant feature of globalised HE, facilitating the operation of increasingly international, mobile, tradable and commercial programmes and services with high incentives for providers. In a university framework internationalisation has been referred to the integration of international and intercultural dimensions into a range of research and pedagogical projects affectively leading onto an expanded range of international activities for students and academic staff between universities and other educational institutions (Robson, 2011).